Planning a Trip to Tennessee soon? If so, then I suggest you stop at DollyWood on your way through Pigeon Forge! I use to visit The DollyWood Theme Park as a child and I loved it! Now they have Splash Country and I can't wait to play on some water rides! I'm hoping to start planning our trip to DollyWood soon! Look at all the awesome deals I found on their site!! You can find anything from Season Pass Deals to Cabin Deals!! These are NOT the only deals on the site! Their were lots more but I only took the screen-shot of a few of them! Check out my other DollyWood post as well! 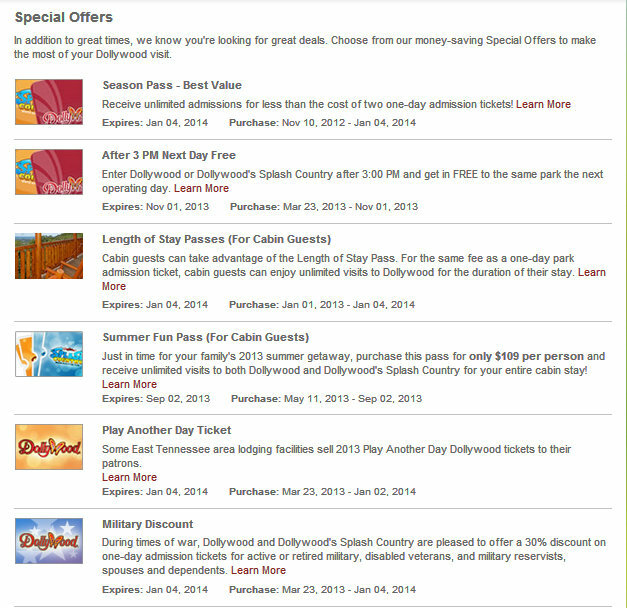 My aunt LOVES Dollywood - we've thought about going before - maybe we will with one of these great deals you shared! That looks like so much fun! I've been THROUGH Tennessee many times, but I'd like to actually stop and visit! Tennessee is beautiful! It's all lit up around Christmas time as well! If your ever in TN, let me know! My house is only about an hour away from Tennessee, if that! I would love to meet in person! Thanks hun! ME TOO!!! My fingers AND toes are crossed!! I plan on wishing upon every star for the extra time and money to allow us to start planning a family vacation. We don't get out very much so my little family is in great need of some Summer Vacation Fun! We visited Tennessee last year. I think we should go again to visit Dollywood. It looks like fun! DollyWood should be at the TOP of your list of places to visit in the next time your in TN! It's been a few years since I've been but DollyWood was wonderful back then and they've done nothing but made it bigger and funner throughout the years! Not to mention all the other awesome attractions in TN, the choices are endless if you head toward the Pigeon Forge and/or Gatlinburg area! I thought this place closed. Ugh now I am regretting not looking into it further when we went to Tenn last summer!